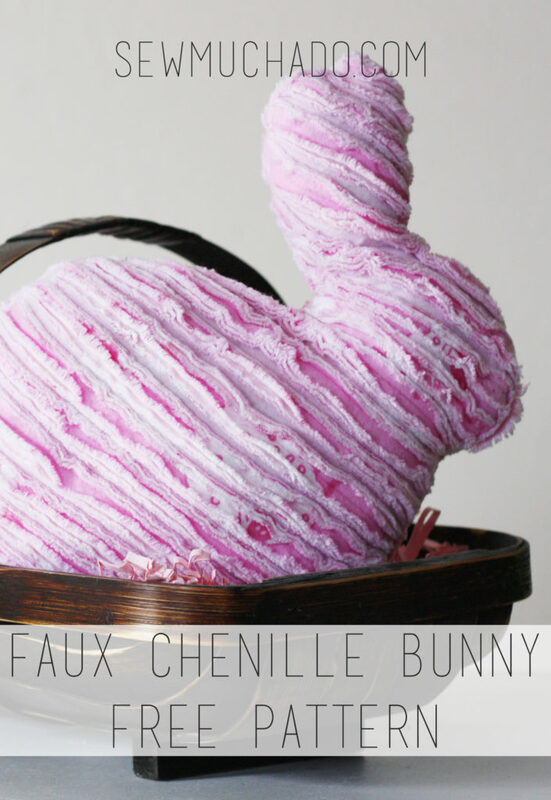 With a free printable pattern, this faux chenille bunny is the perfect gift for any little girl, whether it’s Easter or not! With both Easter and a baby girl coming arriving in our home next month, today’s project is one that will get double the use – my favorite kind of project! Click HERE to download and print the bunny template. 1. Print the bunny template using the link above. Ensure your printer is not set to scale before printing. Join template pieces along dotted line and cut along solid line. 2. Layer two sets of four 12″x12″ flannel pieces on top of each other, matching all four sides. If you are using assorted colors or prints of flannel, alternate the colors and prints evenly as pictured. 3. Pin flannel layers together every few inches throughout each stack. 4. Using one stack of flannel, stitch from one corner to the opposite corner in a diagonal line. If you have a walking foot, use it! It will help to keep all four layers in place as they are fed through the machine. If you don’t have a walking foot, you may want to reduce the presser foot tension slightly to help prevent slipping and stretching of the top flannel layers. 5. Stitch parallel to diagonal line, 1/2″ apart from first diagonal line, and keep repeating until the entire 12″x12″ flannel stack is stitched with diagonal lines. 6. Repeat steps 4-5 with second flannel stack. 7. With one flannel stack, cut in middle between each set of stitch lines, leaving the bottom layer uncut. If you have a slash rotary cutter, it will save a bit of time, but scissors work just as well. 8. Repeat step 7 with remaining flannel stack. 9. Trace bunny template onto uncut side of one flannel piece. Cut along traced line. 10. Flip bunny template over and trace onto uncut side of remaining flannel piece (both bunnies should be facing opposite directions). Cut along traced line. 11. Pin bunnies together with uncut sides facing outward, matching all edges. Stitch around raw edges using a 3/8″ seam allowance, leaving 4″ opening at bottom of bunnies. 12. Stitch again around raw edges using a 3/8″ seam allowance for stability, leaving same opening. Trim seam allowance to 1/8″, clipping close to any tight curves and corners. 13. Turn bunny right side out, ensuring all curves and ears are thoroughly turned. 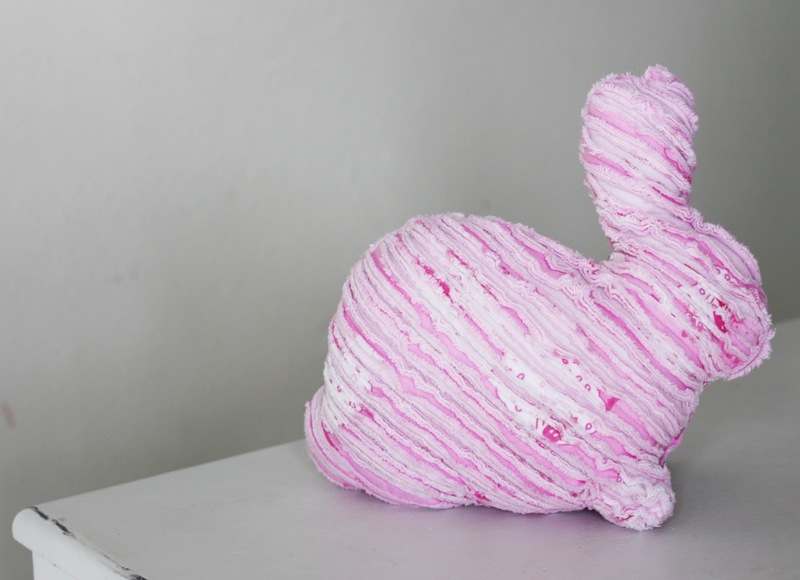 Using polyfill stuffing, fill bunny firmly through opening. 14. Turn raw edges of opening to inside of bunny and handstitch opening closed using a ladder stitch or other invisible stitch. 15. Now for the fun part – throw the bunny in the wash (with a load of towels ideally), and then into the dryer. The raw edges will fray and create the faux chenille look! 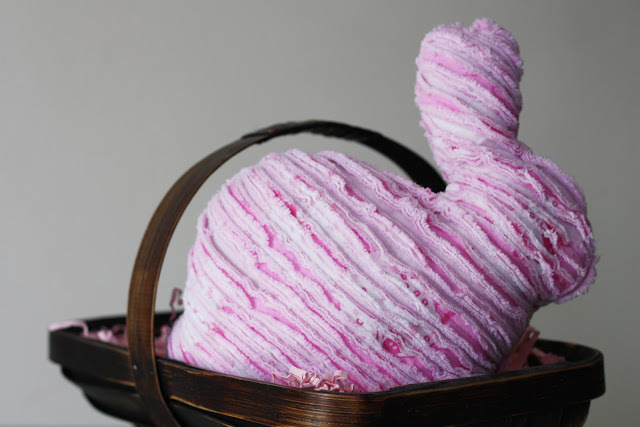 Your bunny will become softer and fluffier with each additional wash! Add your bunny to your little princess’ Easter basket, and let her enjoy her new cuddly friend all year long! Uau it is so cute! Brilliant. I really love this! Thank you so much for this post. I want to let you know that I posted a link to your blog in CBH Digital Scrapbooking Freebies, under the Page 2 post on Mar. 27, 2012. Thanks again. How cute, thanks so much for the tutorial! I love this tutorial. I shall definitely have to have a go at this one! So, so, so, cute!! I think these need to go into my Easter Baskets this year!! 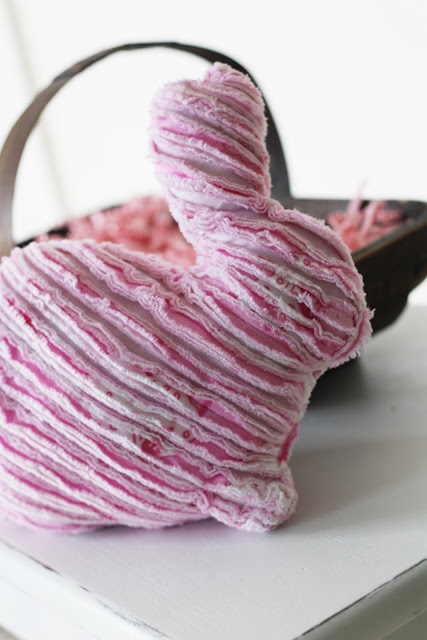 Thanks for the pattern – what a great way to make your own chenille looking fabric. 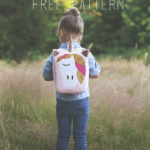 So cute – I wish I had a little girl to make one for. But I’m pinning this so others can see and I can remember. Cutest little Bunny. I’d like one in Pink, yellow, mint green, & white. Thank you for your nice tutorial. Hoppy Easter! I finally got around to making one of these and was pleased with how it turned out. Thanks for posting this tutorial! so cute! thanks for sharing, I had missed it! That is GENIUS! I’m gonna try to follow the same technique to make a pillow…..
blog. I’m hoping to see the same high-grade content from you in the future as well.